As a teacher, and certainly as a Lego Engineering Instructor, I am constantly inspired by kids and simple play. When was the last time you went outside and skipped rope, threw a ball, or played jacks? Sadly for a lot of today’s thoroughly “plugged in” kids, their answers may be quite similar to yours! Often when I’m on the Target prowl, I find myself in the kids’ crafts and stationery sections. I’m a sucker for a fresh pack of Crayolas! Recently I decided to take a detour down the party favor aisle, and boy was I surprised at the COLORS that leaped out at me. Target has a great affordable party line by the name of Spritz that includes everything from favors to decorations to gift wrap. One of my favorite items was a mesh bag full of dual colored mini bouncy balls. I know that a lot of fashion houses are upsizing their pearls for the season, and immediately an idea struck. What if I could string these brightly colored super balls together to make a POP version bracelet a la Wilma Flintstone’s rock necklace? Usually when those ideas strike, there’s just no going back. This bracelet is so incredibly easy to make too! 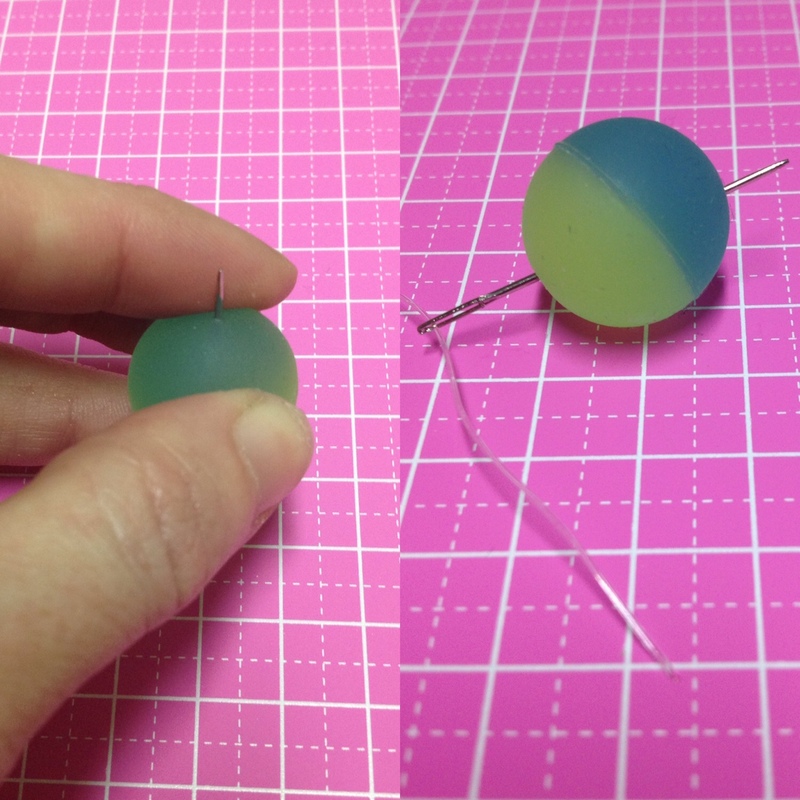 At first, I was worried that I wouldn’t be able to sew through the super ball, but a sharp needle quickly proved me wrong. Though I would consider this a great accessory for kids, I do have concerns about recommending it as a kids’ craft for that reason; use caution and best judgement to your child’s abilities! You can use any diameter of Stretch Magic, but your success will depend on the size of the eye of your needle! PRO TIP – If you have a self-healing mat, or are not afraid of pushing hard on your work surface, I suggest pressing the ball DOWN onto the needle. It helps punch through the rubber and makes for a more successful threading. 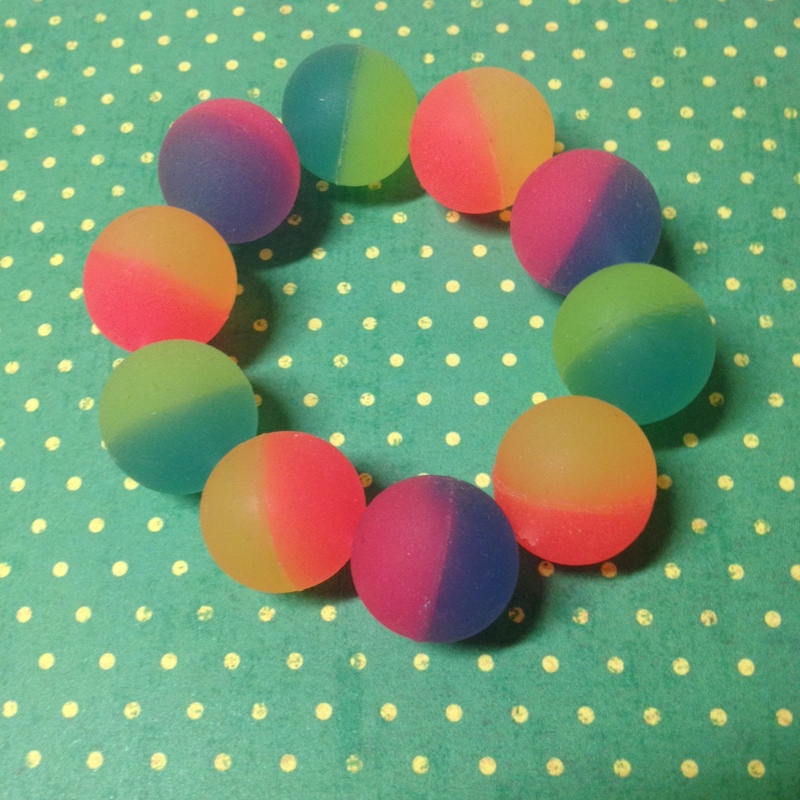 To start, I measured my wrist with a piece of yarn and used that to create a line of bouncy balls, adjusting the order/pattern to my preference. Now it’s time to get to work threading them all onto the cord! Once you have finished threading all of the bouncy balls, be sure to make a TIGHT square knot to secure. This cord does have a tendency to unknot easily, so I doubled my square knot. Since the cord is stretchy in nature, you do not need a separate fastener. That’s it! Fun, fast, and simple. The trifecta of great craft projects! This bracelet is such a fun way to add that little POP of color and joy to any outfit, not to mention the nostalgic feeling that comes along with wearing it. I hope you enjoyed this project; stay on the lookout for more fun Target hacks! 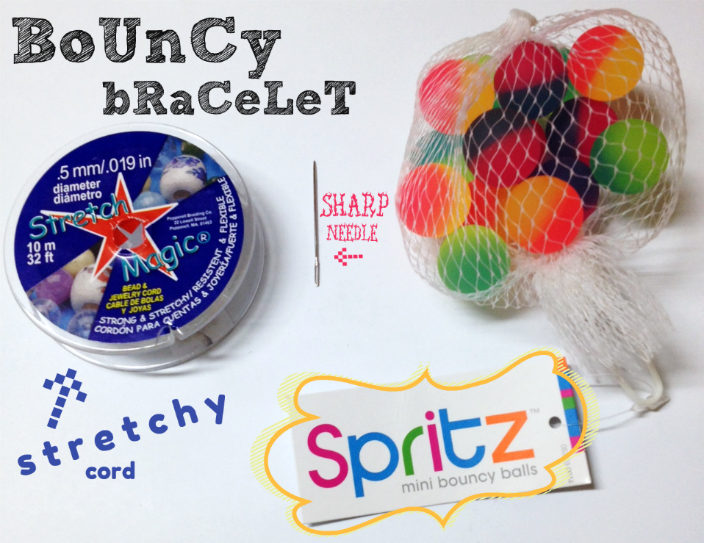 Tags: affordable, bouncy, bracelet, childhood, color, colour, craft, crafting, crafts, easy, fast, fun, hack, jewelry, kids, nostalgia, play, pop, stretch, stretchy, target, toy, toys. Bookmark the permalink. 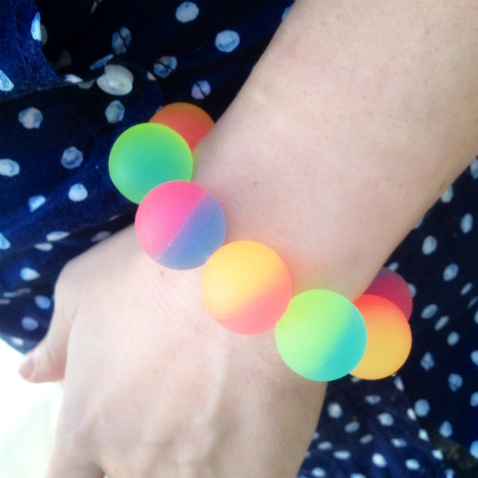 Previous post ← Remember Jelly Bracelets?